Optional items shown are: B. Las Cruces II Copper Fringed Euro Sham(s) SKU 00000, C. Las Cruces II Embroidered Cross Pillow SKU 00000, D. Las Cruces II Embroidered Design Pillow SKU 00000, E. Las Cruces II Studded Cross Pillow SKU 00000, F. Cross Hand Stitched Pillow SKU 00000 and G. Cross Embroidery Sheet Set SKU 000000 are also available. *Super sized, more comforter, these are larger than normal sized comforter, better fit for pillow top mattresses. Fabric: 100% Polyester, Filling: 100% Polyester Fiber. Dry Clean Only. Finish this fashion bedding set off with optional Las Cruces II Embroidered Design Pillows, or Copper Faux Suede Euro Shams. Optional Embroidered Cross Sheet Sets are also available. 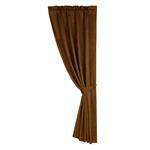 Finish the room decor with Coordinating Curtain Panels and Valance. 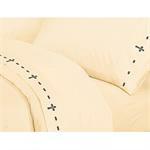 Luxury cream color sheet set. Embroidered with Cross design. 350 Thread count. 100% Cotton material. The Las Cruses II rod pocket coordinating curtain consists of a rich copper faux suede panel with a matching copper faux suede tie back. 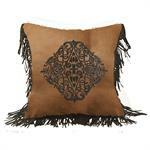 Las Cruces II Embroidered Design Throw Pillow. Dark Tan Micro Suede with rustic turquoise embroidery. Measures 18x18. 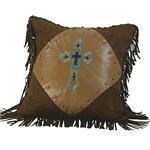 Las Cruces II Embroidered Cross Pillow. Faux suede turquoise with turquoise and brown embroidered cross. 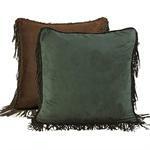 piped in faux suede brown fabric. Measures 18x18. 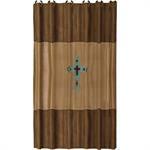 Las Cruces II Embroidered Southwestern Cross Shower Curtain. Faux leather with turquoise embroidered cross pattern. Measures 72x72.